​Also Striking is the Tony Phillips/Mark Bowers/Tim Lowly corpse. Phillips contributes a delicately rendered skull for the head. 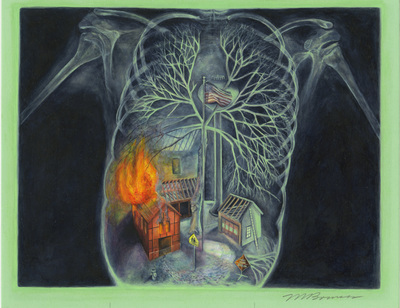 The torso by Bowers is an X-ray which reveals a burning house. Lowly's contribution has legs hidden under beautifully drawn robes. ​Printworks' 35th birthday turns bittersweet after the death of co-owner Sidney Block 105 Chicago art all-stars join in a group show to honor a beloved gallery. Over the years, Bob Hiebert and Sidney Block had become known for staging ambitious themed group shows featuring dozens of artists—from big names to virtual unknowns—in their cramped but venerable Printworks Gallery in River North. For their 20th anniversary, in 2000, Sid and Bob—or Bob and Sid, as everyone variably called them—organized a "Self-Portraits" exhibit involving 60 artists; for their 25th, they mounted a show in which 72 participants designed bookplates honoring the artists and writers, filmmakers, and philosophers who'd influenced their lives. With "Return of the Exquisite Corpse: 35th Anniversary Group Show," the gallery has outdone itself. But sadly, it's also Sid and Bob's final collaboration. Sid died last week at age 91. "There's no question he would've wanted us to go on with the show," Bob says. The exhibit features 35 three-part works by 105 artists, and gives a new spin to the old surrealist parlor game in which players take turns mixing and matching disparate images to create randomly collaborative pictures. As in Printworks' past group shows, the participants represent a veritable cross section of Chicago art history (and beyond) from the 1950s to the present. "When I've asked blue-chip artists such as Jim Nutt, Gladys Nilsson, Kerry James Marshall, Susanna Coffey, there's no reason why they would have to say yes," explains Bob. "Yet they always do—they've always supported us. But also I'd like to prove that there are a lot of wonderful artists who slip through the cracks." Sid and Bob, who's 68, consulted their impressive Rolodex, filled with not just the names of their roster of about 50 artists but also other painters, sculptors, printmakers, and professors who visit the shop, drawn by its curious print-cabinet-like ambience and quirky but welcoming owners. Once they had the 105 artists for the new show, names were randomly drawn and artists were assigned a body part—head, torso, or legs. The gallery sent each artist a sheet of colored archival paper, on which he or she drew or painted portions of human, animal, or fanciful figures. 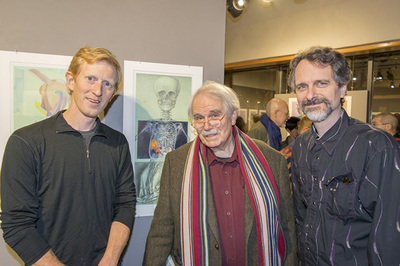 Participants range from veterans such as Richard Hunt, Robert Barnes, and Evelyn Statsinger to gallery luminaries like author Audrey Niffenegger to a half-dozen artists associated with the 1960s Chicago Imagists and the Hairy Who to stalwarts such as William Conger, John Himmelfarb, and Eleanor Spiess-Ferris to younger artists like Mark Bowers and Kate McQuillen. As you might imagine, the results are mixed—how could they not be? Gorgeousness and grotesquery will be in the eye of the beholder. Some of the pieces are surprisingly harmonious, as if they were composed by one hand, while most are wildly dissimilar. It's surrealism. It has been said that depictions of distressed figures is one of the hallmarks of post-World War II Chicago art, and this show makes that case without even trying. The celebration, though, will be bittersweet. Not only were Bob and Sid business partners, they'd been best friends since they met in 1969, when Bob rented a darkroom in the offices of the graphic design firm where Sid worked. They teamed to open a gallery specializing in works on paper in 1980. But within the last year, Sid's health had declined to the point where he'd been unable to come to work. He passed away Thanksgiving Eve. "A birthday celebration of Sid's life," as Bob calls it, is planned at Jean Albano Gallery December 16, when Sid would've turned 92. Printworks' lease is up next August, and shows are booked through then. After that, Bob says, "our future is murky." He cites a shrinking River North gallery district and an aging collector base. RETURN OF "THE EXQUISITE CORPSE"
In January 2000, to usher in the new millennium, Chicago's Printworks Gallery hit on the idea of inviting local artists to collaborate on works on paper depicting—what else?—a corpse. Based on an old parlor game, the idea was to have three artists contribute separate parts of a figure, which would then be joined to create the complete body. 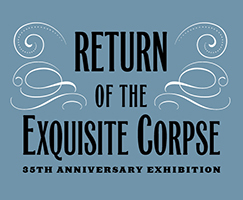 In a return engagement this winter, "Exquisite Corpse" links some tantalizing, seemingly mismatched threesomes, including William Conger, Peter Olson and Richard Hunt; Phyllis Bramson, Michiko Itatani and Holly Greenberg; and Audrey Niffenegger, Kenneth Gerleve and Suellen Rocca. The resulting corpses are wonderfully bizarre and, ironically, pulsing with life.